UPDAYE MAY 19 2015 Royal Dutch Shell is selling off its French LPG field (butane/propane)-they also cut their global oilfield exploration (seismic) budget by $1.5 billion….they will probably focus on Brazilian deep water LNG exploitation….tisk tisk tisk-they need to get solar and wind wound. Last summer in 2014, the New York Times reported that Chevron sells it’s oil filed waste water for farming in California. I had been concerned that the fracking related waste water called “produced water”, which has a high salinity, was being used to de-ice the roads in Pennsylvania. I feared the run off could get into soil and water supplies, and risk our “food” supplies. Who wants to eat produce that is grown with contaminated “produced” waste water? http://www.bakersfieldnow.com/news/local/Oil-wastewater-used-on-Kern-County-crops-298949201.html?mobile=y says “…the general manager of the Cawelo Water District, says they have been buying half a million barrels of water from Chevron every day for about 20 years. Then they dilute it with fresh groundwater. It’s supposed to be a win-win. For every one barrel of oil Chevron produces, another 10 barrels of the salty water come up with it. So I’m reading this and thinking….the saltier the brine, the more radioactive it is….ooops-Chevron sells less radioactive water to the farmers? When NORM (normally occurring radioactive matter) gets disturbed and mixes with mankind’s-introduced-fracking-chemicals, it then is transformed in a new regulated state called TENORM (technologically enhanced NORM). I hope to baby Jesus that TENORM is only found in flowback water and not produced water. But then again I keep coming back to those haunting words……the more saltier-the more radioactive…dang! Flowback is a one time stage that occurs after all the water, sand, & chemicals are pushed down into the ground (frack) to mix with the bowels of earth’s heavy metals, radon, arsenic, NORM, natural formation (salt) water, and other nasty constituents. All that TENORM ladened water flows back up and needs proper (regulated) disposal (to later cause earthquakes). Depending on the geology, some of the “frack on crack” flowback gets left down there to risk other ground water supplies. Whereas Produced Water will have flowback in it (just initially? how long? ), but is basically comprised of the old oceans beneath us that get disturbed when they drill/frack for fossil fuels. These high salinity waters come up (not by choice) and this is what reckless farmers like in California want to farm with? “Brackish” (5,000 to 35,000 ppm TDS) which brackish water in Australia is where Shell is planning to be the world’s biggest producer of liquefied natural gas as was reported by the Australian.com.au. I recall a conversation with a RRC guy who said that the wet drilling mud is something that adds beneficial moisture to our dry Texas soil….I didn’t want to know any more …’nuff said. My gut is that some of your Texas produce may have been grown in TENORM drilling mud. But before I end this blog about produced water, I must add that there are also issues with spills at these drill sites that cause the metals in the dirt to bind and leach out and make the spill to be even more toxic because of the COLLOIDS. So the question begs if you take produced water and add it to dirt, aren’t you inviting a heavy metal concert to your diner table? Why not instead create your own water out of thin air instead of dredging it up from the bowels of the earth? I blogged about how globally that type of gas yields a mother-load of produced water in relation to the actual gas you get…which makes me think they are getting into the selling nasty water business? 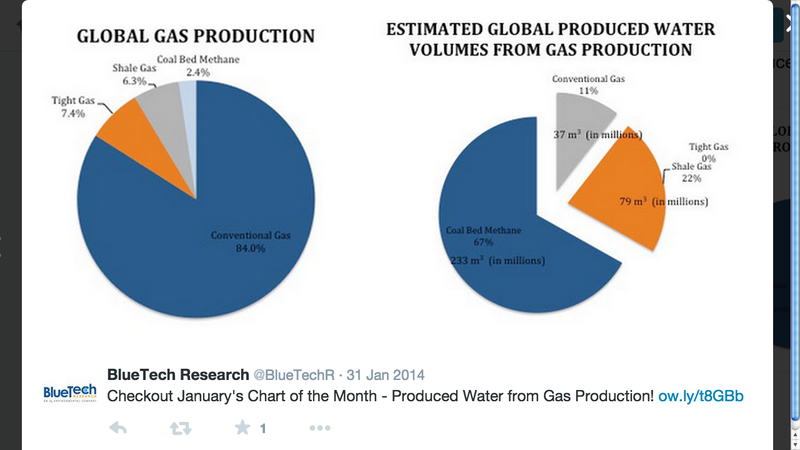 Coal Bed Methane represents only 2.4% of global gas production, yet accounts for an estimated 67% of the global ‘produced water’ that gets disturbed, brought up, and needs to be disposed of properly (to later cause frackquakes). This entry was posted in COLLOIDS, frack on crack, recycle and tagged Agriculture, brazilian, bromide, ca, California, Chevron, Colloids, deep water, dirt, dutch, earth quake, exploration, farmers, foods, frack on crack, frackquake, french, generator, heavy, heavy metals, humitity, injection, jessica ernst, kern, lng, lpg, menorah, metal, metals, nestle, norm, organic, produced, quakes, royal dutch shell, royalties, run off, seismic, seismic exploration, selling, shell, soil, sol, tds, TENORM, total, water. Bookmark the permalink.